The holiday wrappings and glitter are packed away, new calendars in place and regular activity resumed. The new year is still fresh and expectant. It’s a perfect time to think about where we were last year and where we hope to be at the end of this year. It will only take fifteen minutes to draw a road map of our hoped for destination for the coming year. Knowing where you intend to go will help make decisions and guide your actions during the coming year, reducing stress, as well as saving time and money. First, we need to figure out where we are. Take a moment to jot down your top accomplishments for the past year. Our financial advisor is always amazed each time we meet because this list is at the top of the paper work I hand him. He became so convinced of its importance that he began requiring his other clients to do the same thing. People don’t give themselves enough credit for what they have already done. Little accomplishments slide by in the busyness of life. Yet even small achievements provide us with encouragement and motivation! No need to stress or overthink – just jot down what quickly comes to mind. These can be anything and do not have to have been on any previous list. We had new electrical lines installed thanks to the city and ended up replanting the back yard last year. Not on our radar at the beginning of the year, but an improvement and an accomplishment for this year! This list has another positive factor. What you recognize as accomplishments are quite likely to be things that you value. It’s a painless way to bring your hopes and dreams into the light. If someone says, write down your values or your goals, it is hard to do and sometimes turns into a trip down fantasy lane. Fantasy lane has its place, but we also have to work with the cards we get handed to us! Our list of accomplishments recognizes this. If the list does not align with your values, you will be able to see that too and work to make course corrections. I mentioned a back yard planting above that was not on our last years list. But it does fit with our values in keeping our home and yard maintained and a pleasant place to be. Acknowledge each achievement! This list can be rather long! I like to hang on to the annual achievement lists just to look back and see what we have done! Evaluate each item on the list. Ask the questions below about each item and go with your immediate answer – the one you automatically “know”. Take about five minutes total. Do I want / need to do more of this? If the answer is yes, skip the item and come back to it later. If the answer is no, cross the item out and pat yourself on the back! One of our goals last year was to set up adequate insurance coverage, done and off the list. It’s a thrill to zip down the list crossing off the completed items! That process is usually quick! The remaining list should be fairly short – between five and ten items. For those items you skipped because you need to do more, jot down beside them what would be “enough” for the coming year. It might be pay off twice as much debt, lose 10 more pounds, organize the closets while keeping the basement clutter free. When you have finished this, double star each item on your list that is an absolute must. To continue the weight loss as an example: If weight loss is a major health issue, that is a priority. Last year’s accomplishment was to change eating habits by finding healthy recipes. What else will help move toward weight loss? Perhaps it will be to find a group meeting for support. Continue to evaluate each item to determine what you would like to do to move it forward or complete it, then decide if it is high or low priority. Put a single star by the low priority items you choose to continue to address. An example of low priority might be to save for a Disney trip a few years down the road. A simple decision to set aside $20/month toward this goal for the next year will get things started and next year, the goal might be to increase the monthly savings and begin to accumulate Disney tips and information so your goals can become more specific. Finally ask yourself: What else must be addressed in the coming year? Add this to your list. If you need to spend more time thinking about the specifics of addressing the issues, flag the items so you can come back later. Again, double star top priority items that must be handled. Congratulations! You have just set your goals for the New Year! 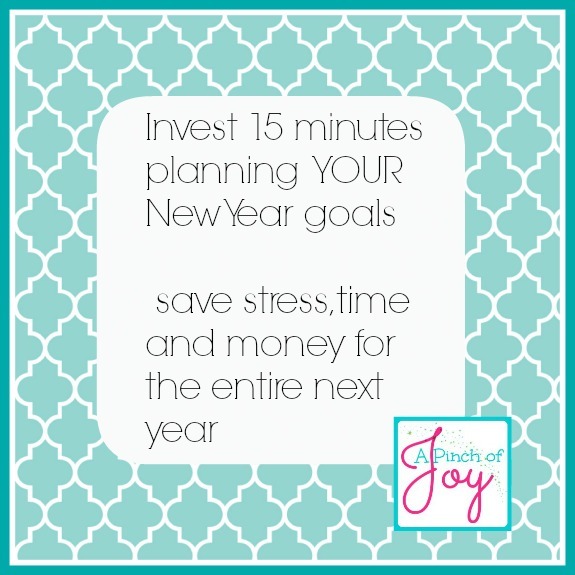 Fifteen minutes that will pay off many times over because you know where you are headed!